You should regularly check the balance of the Accrued Purchase Receipts (formerly known as Purchase Suspense) account. It should be equal to the inventory receipts that have been posted without a corresponding purchase invoice. You can review Inventory Receipts posted without being linked to a Purchase Order. Inventory Receipts credit the Accrued Purchase Receipts account. If the receipt isn’t linked to a Purchase Order, then there is no Purchase Invoice to debit (i.e. clear) the account. Browse to Inventory > Transactions > Inventory Receipts report. Select PO Number from the Type drop down. Click ‘Save‘ and close Configuration Manager. 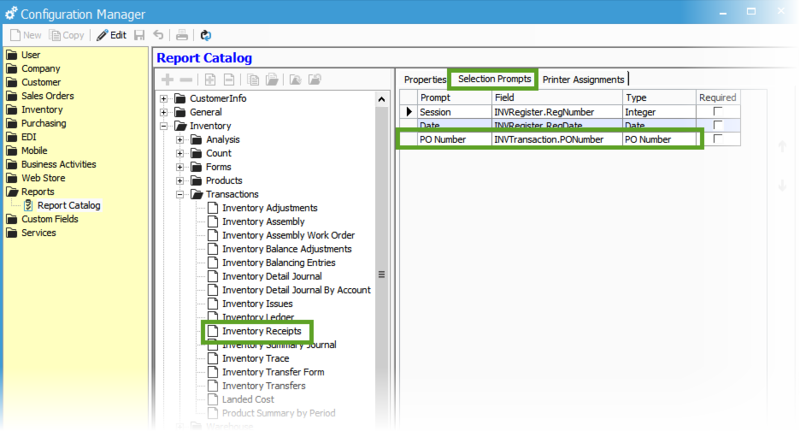 Open the Inventory Receipts report from the Transactions folder on the Inventory Reports main menu (Inventory > Inventory Reports > Transactions > Inventory Receipts). Adjust the Date to the appropriate period to research (if necessary) and click Preview. As explained above, if a Purchase Order has no receipt associated with it, the Accrued Purchase Receipts transaction will be one-sided. Reviewing the Inventory Receipts report filtered where the PONumber is blank will return a list of all receipts not tied to purchase orders. You can correct this by posting an adjusting entry in QuickBooks for the total amount of these receipts against the Accrued Purchase Receipts account. When a non-inventoried item is included on a Purchase Order, you can invoice the product but not receive it into inventory. This will cause the Accrued Purchase Receipts account to be debited for the amount of the inventory, but not credited when the receipt is posted. Review any Purchase Orders that contain non-inventoried items, then post an adjusting entry in QuickBooks to offset the cost of the non-inventoried items in Accrued Purchase Receipts.